In a city where ever-rising rents often hamper potential small business owners from opening a storefront, mobile retail has become a popular alternative. Food trucks certainly led the way over the last few years, but the business model has spread beyond the culinary world and now includes a flower shop on wheels. 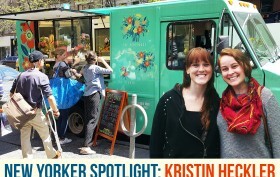 A year ago, Ashley Custer and Kristin Heckler introduced New York to Uprooted Flower Truck. The business parks in neighborhoods around Manhattan to sell their New York-inspired, hand-tied bouquets available in three sizes: studio, loft, and penthouse. The driving force behind Uprooted is to not only bring flowers directly to New Yorkers, but to help people engage with and hopefully gain a deeper appreciation for them. 6sqft recently spoke with Kristin to learn more about this budding business and how it’s developing a unique identity in the city.